218 Commonwealth is located on the south side of Commonwealth, between Exeter and Fairfield, with 216 Commonwealth to the east and 220 Commonwealth to the west. 218 Commonwealth was designed by Alfred S. Bither, architect, and built in 1879-1880 by Samuel T. Goldthwait and C. E. Chapin, masons, and Alonzo Locke, carpenter, one of four contiguous houses (214-216-218-220 Commonwealth). As originally built, 214 and 220 Commonwealth were matching houses and 216 and 218 Commonwealth were matching houses. All four houses are shown as the being same height on the 1887 Sanborn map. Additional stories were added to 216 Commonwealth and 220 Commonwealth by the late 1890s, as shown on the 1898 Bromley map. The original permit applications for 214 and 220 Commonwealth, dated May 28, 1879, do not indicate the architect; the permit application for 216-218 Commonwealth (one application for both houses), dated March 28, 1879, and the final building inspection report (also one for both houses), dated October 5, 1880, indicate Alfred S. Bither was the architect. 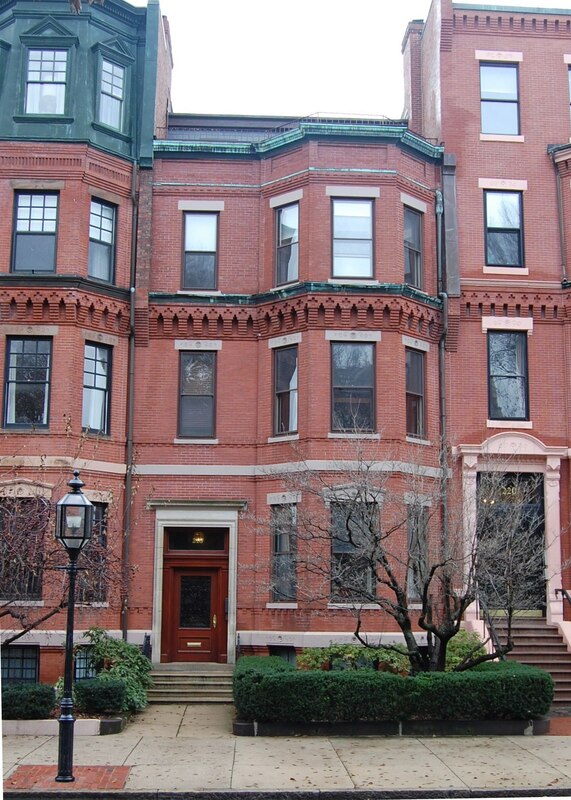 In his Houses of Boston’s Back Bay, Bainbridge Bunting attributes 216-218 Commonwealth, 435 Beacon, 7-9-11 Hereford, 364 Marlborough, and 27-29-31 Hereford – all built in 1879 – to R. S. Bither. This is a misreading of the handwriting on the permit applications. It is clearly written as “A. S. Bither” on several of the permit applications, and is less legible on several others. There was no R. S. Bither listed in the Boston City Directories at any time in the 1870s or 1880s, whereas Alfred S. Bither was a practicing architect there from 1870 to 1880. 216-218 Commonwealth were built for George Henry Mackay. He is shown as the owner on the original permit application for both houses. His father, Robert C. Mackay, built 220 Commonwealth at about the same time. 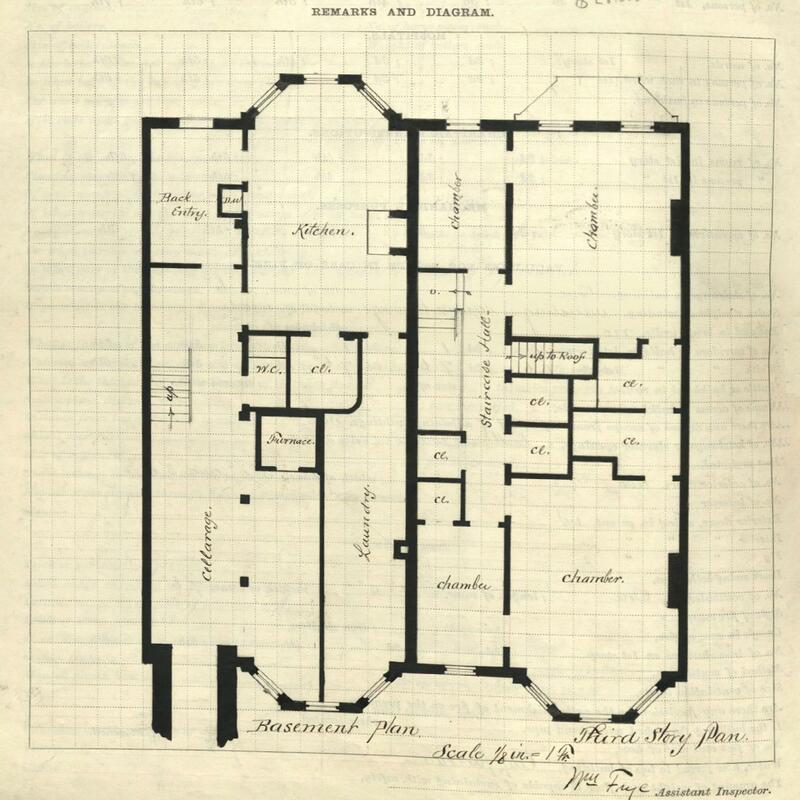 George Mackay sold 216 Commonwealth and he and his wife, Maria (Starbuck) Mackay, made 218 Commonwealth their home. George Mackay purchased the land for 216-218 Commonwealth on April 7, 1879, from the National Bank of Commerce of Boston. The original lot was 49.5 feet in width. He subdivided the western 48 feet into the lots for 216 and 218 Commonwealth, and sold the eastern 1.5 feet (with the eastern half of the party wall at 216 Commonwealth) in September of 1879 to James Barr Ames. The lot George Mackay purchased from the National Bank of Commerce was part of a parcel the bank had acquired on May 18, 1876, from Nathan Matthews, which, in turn, was part of a larger tract originally purchased by Nathan Matthews on January 2, 1871, from David Sears, Jr., Frederick R. Sears, and Knyvet Sears. Click here for an index to the deeds for 218 Commonwealth. On January 30, 1880, George Mackay transferred 218 Commonwealth into his wife’s name. They probably moved to the new house soon thereafter, and were enumerated there in the US Census, taken in June of 1880. They previously had lived at 176 Beacon with his parents, Robert C. Mackay and Charlotte Langdon (Lodge) Mackay, who moved to 220 Commonwealth at about the same time. George Mackay was a shipping merchant in the East India trade in his father’s firm, Mackay and Coolidge, and later became a stockbroker. George and Maria Mackay lived at 218 Commonwealth until about 1901, when they moved to a new home they had built at 304 Bay State Road. On February 1, 1901, 218 Commonwealth was purchased from Maria Mackay by Grace Evelyn (Atkins) Reed, the wife of William Howell Reed. They previously had lived at 37 Commonwealth. They also maintained a home in Belmont. William Reed was treasurer of the Ashton Valve Company, manufacturers of steam valves. During the Civil War he had served as a member of the U. S. Sanitary Commission, and following the war he wrote two books on the subject. William Reed died in October of 1914. Grace Reed continued to live at 218 Commonwealth until her death in 1920. On March 30, 1921, 218 Commonwealth was acquired from Grace Reed’s estate by Katharine (Brayton) MacAusland, the wife of Dr. Andrew Roy MacAusland. They previously had lived at 7 West Hill Place. Andrew MacAusland and his brother, William Russell MacAusland, were physicians and orthopedic surgeons. They maintained their practice together at 240 Newbury. They also were brothers-in-law, William MacAusland having married Katharine (Brayton) MacAusland’s sister, Dorothy. In the late 1920s, Andrew and William MacAusland acquired 412 Beacon and converted it into medical offices for themselves and other doctors. They continued to maintain their medical offices there until the early 1950s. In February of 1951, Andrew MacAusland filed for (and subsequently received) permission to remodel the first floor of 218 Commonwealth for use as his medical office. After the remodeling was completed, he moved his offices there; William MacAusland continued to maintain his practice at 412 Beacon. Andrew and Katharine MacAusland continued to live at 218 Commonwealth until about 1965. On June 29, 1965, 218 Commonwealth was purchased from Katharine MacAusland by Octavia Morley (Sawyer) Walsh, the widow of Edward M. Walsh. She previously lived at 52 Bay State Road, and before that at 251 Beacon. She continued to live at 218 Commonwealth in 1967, when she moved to 78 Marlborough. On August 11, 1967, 218 Commonwealth was purchased from Octavia Walsh by Irma Edith (Rosen) Shapiro, the wife of Isadore Charles Shapiro. They previously had lived in Newton. He was treasurer of the Harrison Supply Company. They continued to live at 218 Commonwealth in 1973. On October 1, 1973, Irma Shapiro transferred 218 Commonwealth to herself as trustee of the 218 Commonwealth Trust. On February 27, 1974, 218 Commonwealth was acquired by Robert H. Johnson, a lawyer specializing in the publishing industry. He was unmarried. He lived at 218 Commonwealth until his death in September of 1986. On February 26, 1987, 218 Commonwealth was purchased from Robert Johnson’s estate by Thomas Joseph Dooley, Jr., and his wife, Helen Dooley. In July of 1987, they applied for (and subsequently received) permission to convert the property from a single-family dwelling and doctor’s office into four apartments. In July of 1989, they amended their plans to expand the penthouse so that it extended the entire width of the building. In May of 1992, the Dooleys filed for (and subsequently received) permission to change the occupancy to be four units and a doctor’s office, noting that the use as a doctor’s office had been inadvertently omitted from their 1987 application. On July 25, 1992, 218 Commonwealth was acquired from the Dooleys by their daughter, Linda Jean (Dooley) Hanifin, wife of Timothy Thomas Hanifin, as trustee of the Hye-Eire Trust. 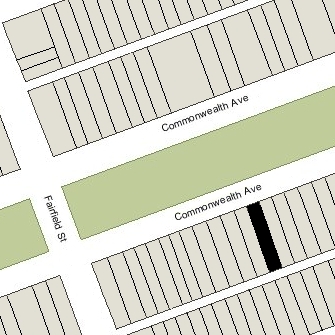 218 Commonwealth remained an apartment house, assessed as a four- to six-family dwelling, in 2016.